Last week when we did the water marble design for the Halloween Challenge, I really loved the two red-backs I added to one finger and commented I would have to do a full red-back mani. Here it is. I used OPI Samoan Sands as the base then painted on the black funky french freehand. 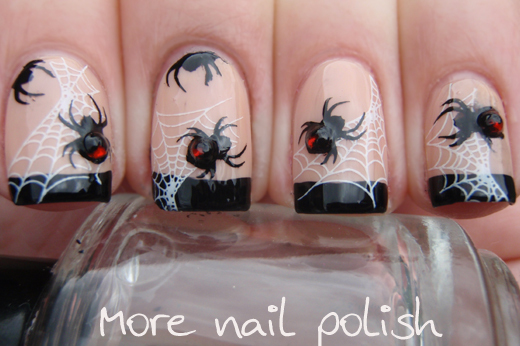 I used BM13 for both the white webs and black spiders and stuck red rhinestones to the body. I then painted most of the rhinestone in with black polish and a fine brush, and just left the red line down it's back. Finished with a coat of Seche Vite to seal in the stamps and hold on those rhinestones. I also entered this design in the Bundle Monster Fright Night competition on Facebook. 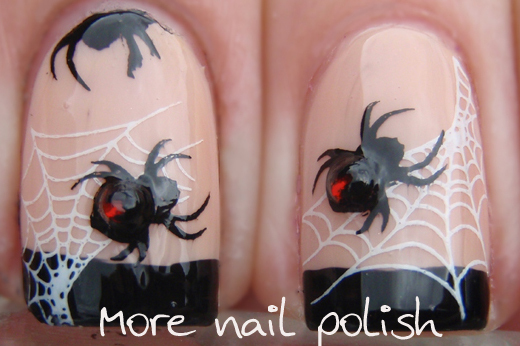 There are some amazing entries that you should check out if your looking for some Halloween Nail Art inspiration (and while you're there, I'd love it if you voted for my design). I love these little guys bulbous bodies. Thanks for visiting, and voting ;) and I hope you had (or are still having) an excellent weekend. That's awesome! I cross my fingers that you win! This is beyond perfect. I love this!! Peeeeerfect! I love it so much!!! This is just AWESOME! Lovely work!! Good luck! PS - Just voted for you too. Good Luck! EEEK! These spiders are making my skin crawl! Great job on the detail, possible too good... now I need to look at some kittens or something. OMG, this is AMAZING!!!!!! they look so real!!!! 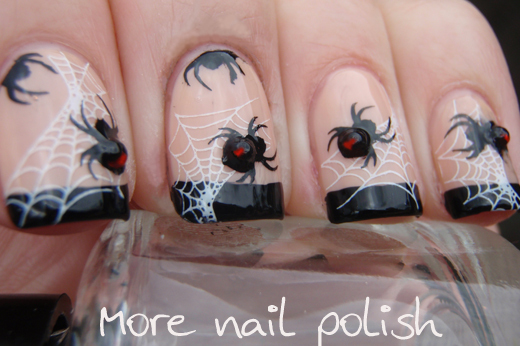 best spider imitation on nails I have seen yet!!!! This looks a lot like the mani I did at the beginning of the month.